This oversized rectangular ottoman is the perfect complement for a large chair, sectional, or oversized sofa. 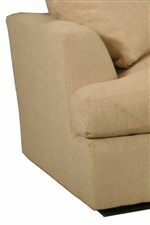 The plush top cushion offers a comfortable spot to rest your feet, and can act as an extra seat when guests arrive. Complete your living room ensemble with this high quality upholstered ottoman. The 0977 Large Contemporary Rectangular Ottoman by McCreary Modern at AHFA in the area. Product availability may vary. Contact us for the most current availability on this product. The 0977 collection will add a comfortable look to your living room or family room. These oversized pieces have plush seating. Clean lines and slightly flared arms create a casual contemporary style that is sure to complement your decor. These pieces are built with quality construction in the USA, and will hold up to everyday use in your busy home. The 0977 collection is a great option if you are looking for furniture in the area.